In case you have been wondering... "What ever happened to Sandy's 40 Tangles for her Birthday Project?" Well, I didn't get 40, closer to 30, but that just proves that I am still young at heart, right? But what I did get were absolutely beautiful tiles!!! 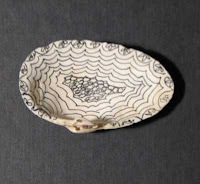 I love the way that people incorporated their own patterns, words and even objects of importance to ME - into their tangles. One on the left there even has a cat and the Eiffel Tower (I went to France in Sept.) I got tangled tiles, envelopes, notebook pages and even a SHELL! I got a bit behind with patterns, so here's a two-fer - Pane and Beedle. I think they look rather Holiday-ish. Good background for a wreath or a cozy fire... These two tangles are ones I designed based on some carved woodwork (Beedle) and a stained glass window (Pane). Although Pane also looks like a coffered ceiling or wood paneling. To make it look more dimensional - after you shade the top and left sides of each section, try smudging (with your finger) across the upper left corner of the back square (or rectangle). Beedle doesn't need step-outs to draw. 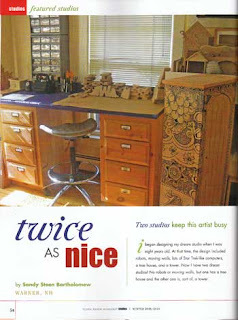 It's just like Pearlz - a row of circles - but you can alternate circles with ovals. To have white beads, just add a little crescent of shading near the bottom of each bead. For black beads, draw a little circle (or oval) at the top of each bead. Leave that part white and color in the rest. Easy. Remember, to make something look like it is in front of the picture - draw it FIRST. Everything else goes behind it. 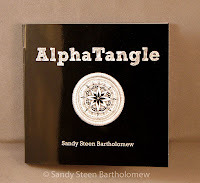 "AlphaTangle - A Truly Tangled Alphabet" is an adorably teeny (4" square) book of alphabet letters created from Zentangle patterns. 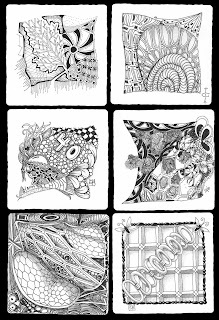 All the official Zentangle tangle/patterns have names and I have created each letter from the patterns starting with those same letters. The original art was drawn with a Micron pen and shaded with pencil. I designed and laid out the book and it was printed by Brayshaws, a local printing company. I hope it provides inspiration for fellow Zentanglers. I am happy to sign your copy! Note: the books are available at wholesale for brick and mortar shops and CZTs. Please email for info. It is finally done! I actually completed all the alphabet letters by the end of the summer. But it took me longer to do all the scanning, clean-up, layout and printing stuff. But, the important thing is, I DID do it. Yeah! I get a very weird feeling of satisfaction at holding a little stack of these books and thinking "Mine!" But now, the really hard part... 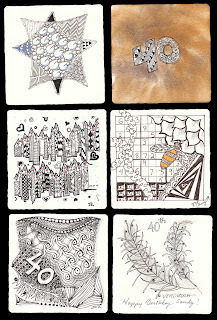 I need to get them out of my hands and into Zentangle, and potential-Zentangle, enthusiasts' hands. If you would like a copy (or two - they're small! ), the books cost $9.99 plus $1.50 for s/h. You can buy one from my etsy store (Bumblebat) or you can send a check to Beez Ink Studio, PO Box 359, Warner, NH 03278 and I will send it right out! 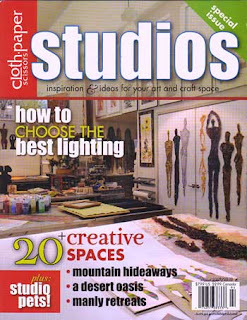 I also have some copies of Cloth Paper Scissors with the Zentangle Journalling article ($7.99) and the Studios Magazine with my tangled studios (also $7.99). You're Invited to a Tangle Share! Come to a Tangle Share on December 12th between 11 and 2. Stop by The Belfry during the Warner Holiday Shopping Tour and show off your Tangles! Everyone wants to see what you have been creating. 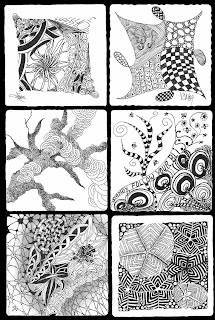 Or perhaps you have not yet taken a Zentangle class and would like to see what it's all about? 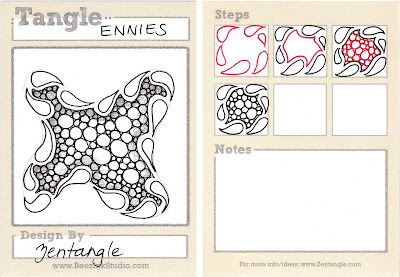 Or you are already addicted to Zentangle but you're having a hard time explaining it to your friends and family!? Bring them along - everyone is welcome. 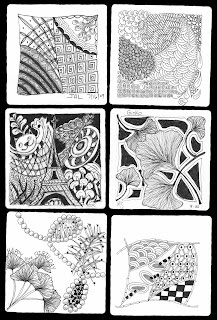 Work on a group tangle, eat yummy snacks, get a collectible Tangle ATC. Stop by anytime between 11 and 2. Ennies takes a bit of practice. I didn't like it at first. Now I find it strangely satisfying. With the right shading (I like to put a little shading just under the edge, over the circles - the caviar) the design actual seems to be moving. Depending on the time of the month, it can seem a bit like sperm and eggs. But, at least for the past few weeks, it looks a lot like the inside of my head! Has anyone out there learned how to love the holidays? I really want to... I just hate this time of year. Could be that I know winter is coming too. Thought I'd let you know about a very cool source for "things to paint". My friend Deb Damboise owns a company called "Say It with Letters" located in Manchester, NH. She has a ton of interesting "wood" (mdf) shapes and alphabets in stock and she can also do custom cutting for a ridiculously reasonable price. I send her line drawings and I can get my shapes up to 48 inches! 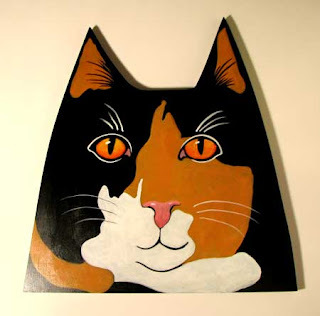 On my other blog I did some memorial pieces for my cat who died last week. All the parts, except the letters are my designs, cut by Deb. 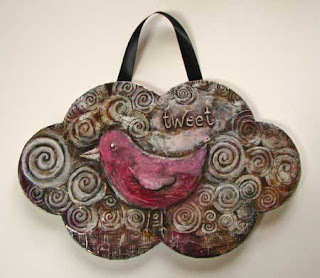 This piece, "Tweet", is her cloud shape, covered with embossed metal and acrylic paints. 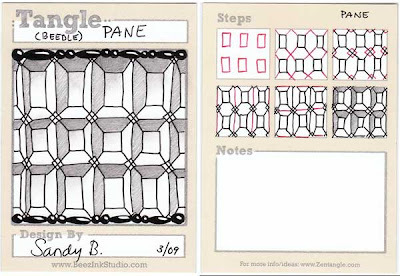 If you are interested in learning to emboss metal, there is a class at Wingdoodle this weekend and they also sell the Ten Seconds Studio supplies there. It is my habit to try and create some kind of art when a fur-baby dies. 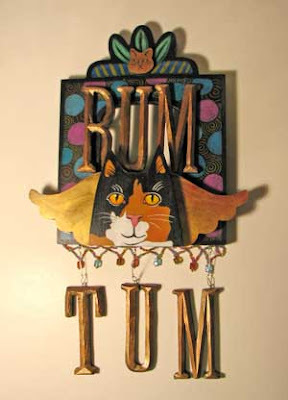 So I made two for Rum Tum. 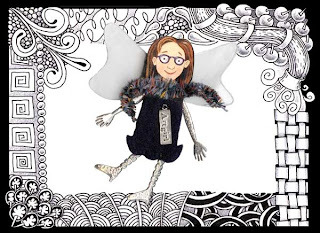 The first is her memorial angel-cat piece and the second is kind of like a portable mural. I will probably make a mural piece of my still-living cat, Lilo Bean, as well. The memorial/shrine piece is mostly acrylics and the background shrine part is black gesso with colored pencils. It is much more vibrant in real life, but I ignored every rule of photographing artwork in my haste to post it here! The portrait is almost 2 feet high, or so. I decided to keep the cat faces sort of folksy and graphic and just make her eyes more 3-D.
We are a two-cat family and we are all missing cat number two. Even Lilo Bean seems a bit confused and lonely. 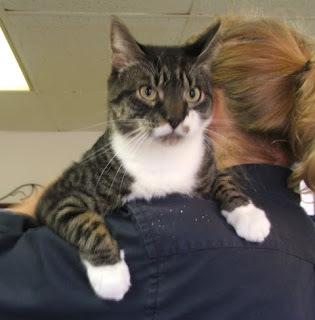 So, when I read the newsletter from W.A.G - We are Animal Guardians (we got Rum & Lilo from them) I decided to find out if they have a new fur-baby for us. Our family has an older female cat and a toddler child, so Sheila had to do some serious thinking on what cat would fit in here. She sent us photos of three cats and we all crowded around the screen to argue the merits of each! I'm leaning toward "Charlie" who reminds me a lot of a past cat I had, named Sakhi (Sakhmet the Egyptian Goddess of War and Pestilence - she mellowed with age.) Except that he looks like he has a sweeter disposition. After all, I don't want him to eat my baby, right? 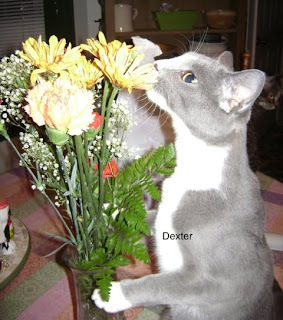 "Dexter," the gray tuxedo cat looks sweet too and Lilah really liked his photo - he was sniffing a bouquet of flowers. 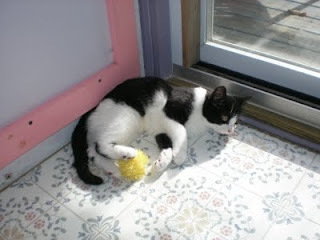 And the B&W kitten, Phoebe.. adorable. It's hard to pick just one - I can't wait to meet them!